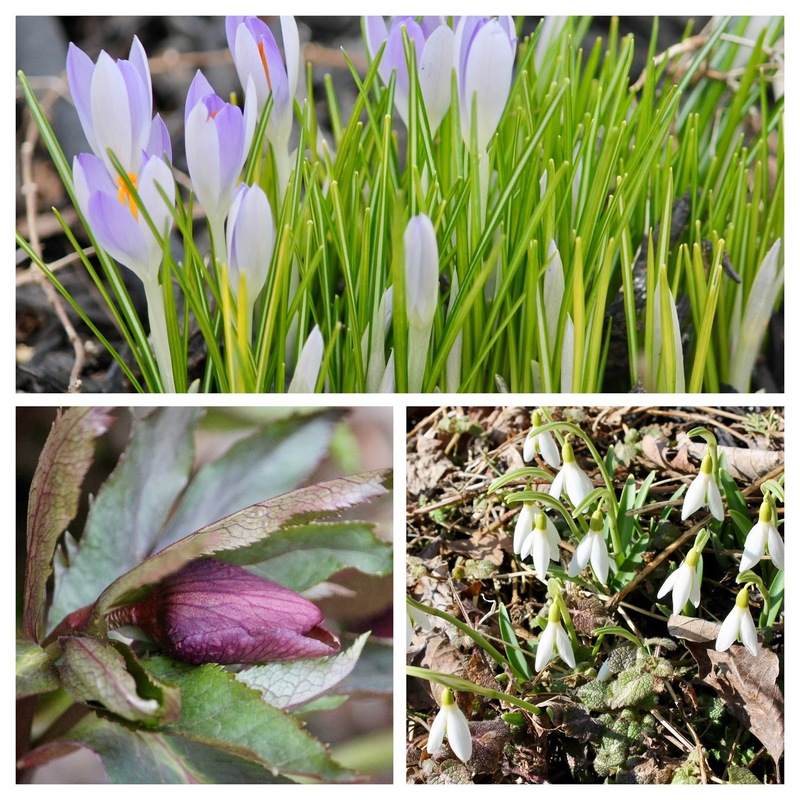 The stars of my March garden were crocuses, snowdrops, and hellebore buds. The floral trio appeared when the snow began to melt during the second week of the month. March came in like a lion with a snowstorm; it went out, not exactly like a lamb, but with rain showers and warmer temperatures. 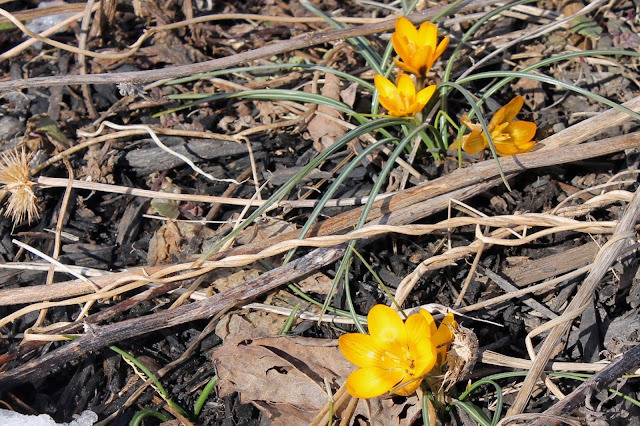 I began the spring cleanup by picking up fallen branches and cutting back the grasses and some perennials. I planned to prune several shrubs, but most days were just too cold for my old bones. Spring is late, however, so I believe I have time yet. March came in like a lion. 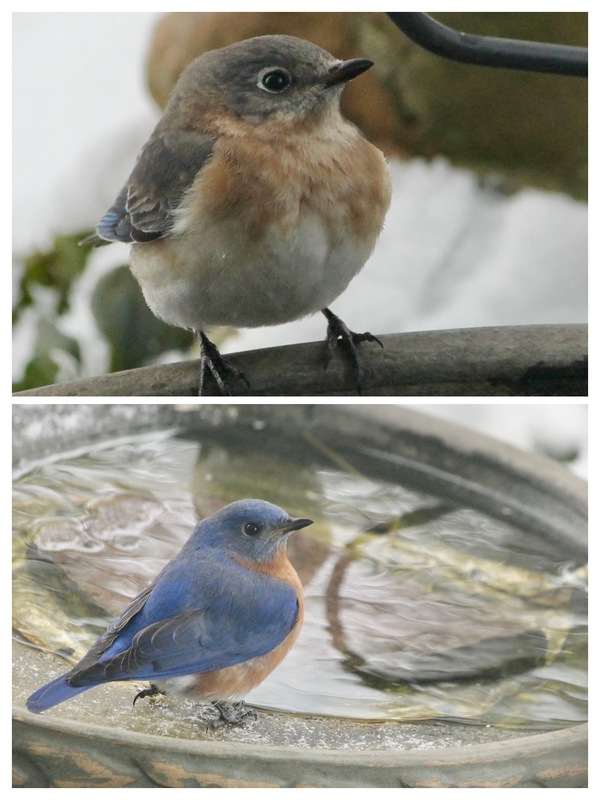 The snow brought a bluebird and his wife to the heated water dish. This winter I haven't seen as many as usual, so I was thrilled to see this pair of cuties. 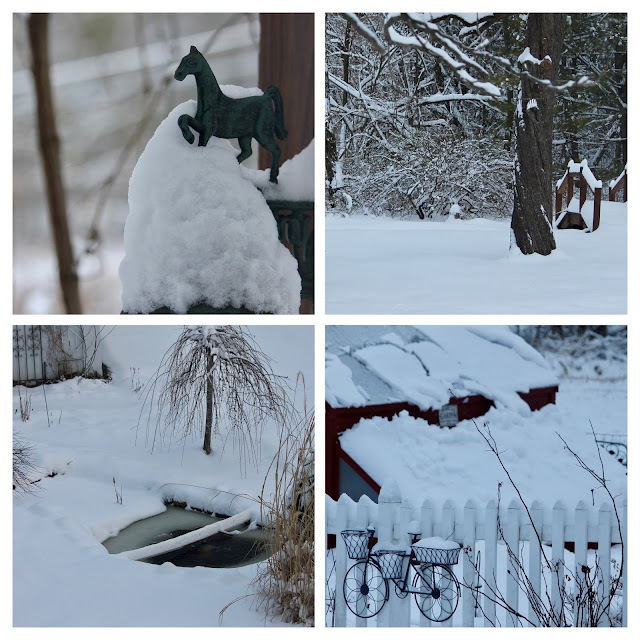 Serenity Garden as the snow began to melt. After a week, the snow receded and the crocuses appeared. 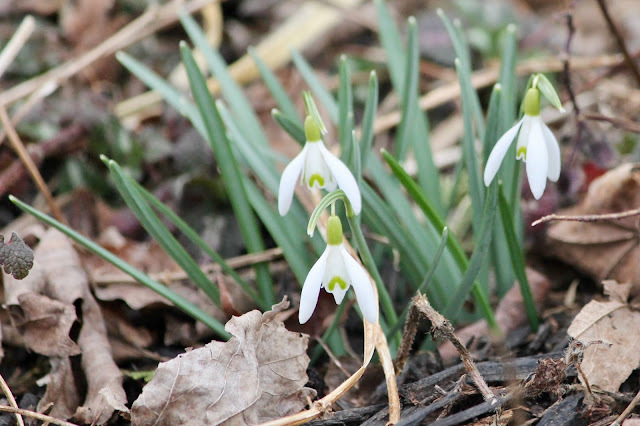 I found two small, white patches of snowdrops in Serenity. They are all that remain of the five or six I planted some years back, but are welcome all the same. 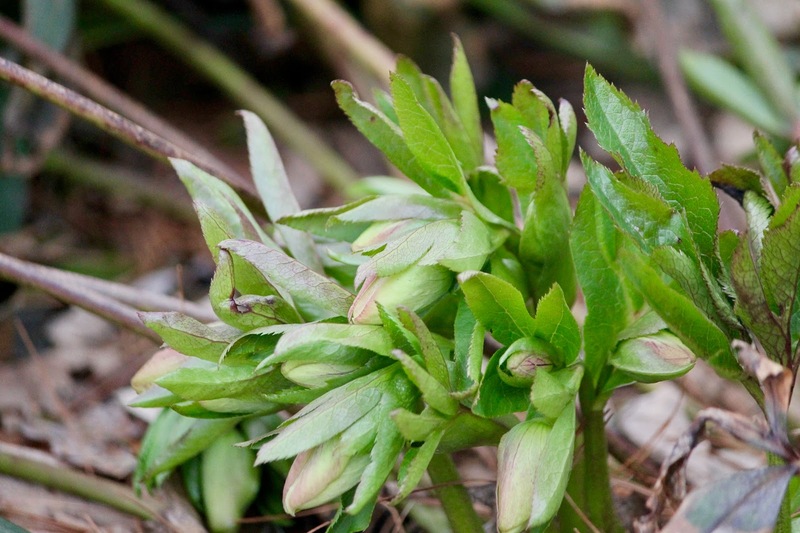 I saw hellebore buds in the woodland garden. 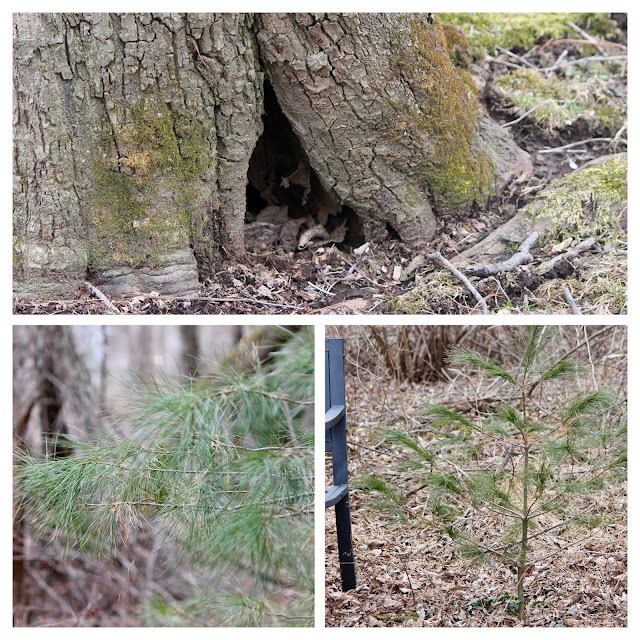 The white pine that Duane planted last year is flourishing. I wonder who lives under the old pear tree (in the top picture). After we cut down the tall grasses near the pond, we could see that the weeping spruce has become very shaggy. I think it may benefit from a haircut. 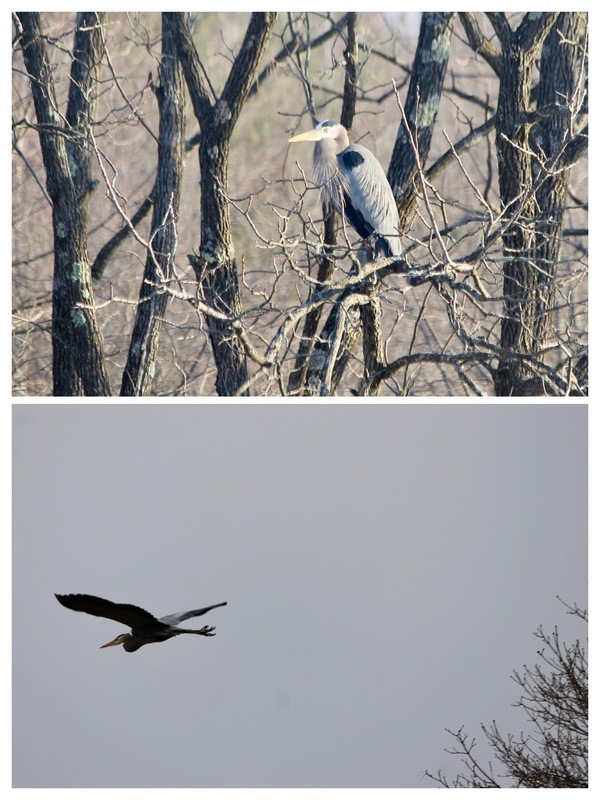 A great blue heron has stolen fish from our pond. 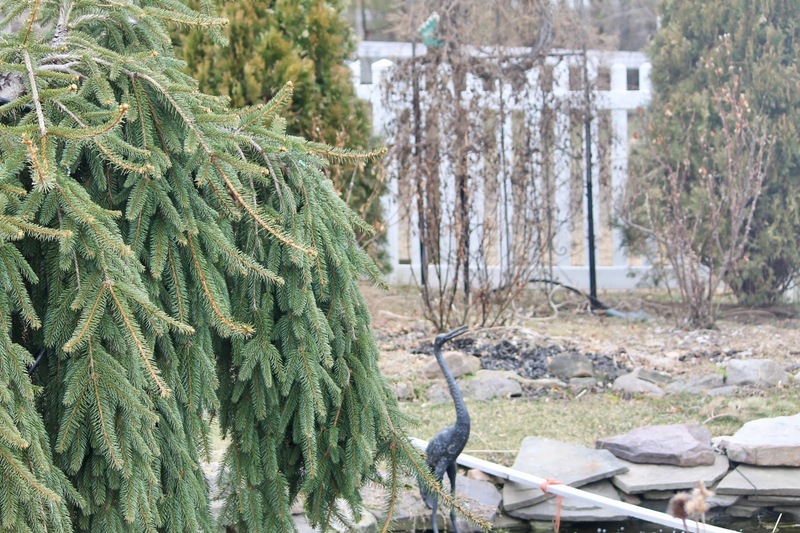 We haven't seen the heron lately, and just hope he didn't eat too many of our koi. We learned the best method of protecting fish from predators is to provide places for them to hide at the bottom of the pond. We hope they are inside the clay pipes that Duane located there. We will find out how many we have when the water becomes warmer and the fish start to eat again. Soon the daffodils will be blooming! 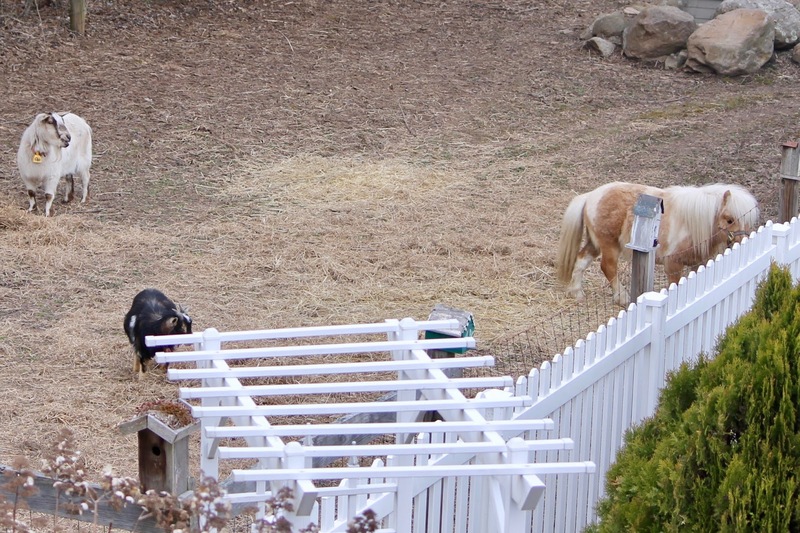 As many of you know, my sweet mini horse, Dude, died last summer. Last week we were happy to welcome Charm, another mini horse, into our family. We met him on March 17, St. Patrick's Day, so Duane calls him 'Lucky Charm.' I'm glad to say my three garden buddies are getting along. I'll post some better pictures soon. Billy Goat (the white one), Doodles, and Charm. Do visit Sarah at Down By the Sea for spring in England and some March hares. 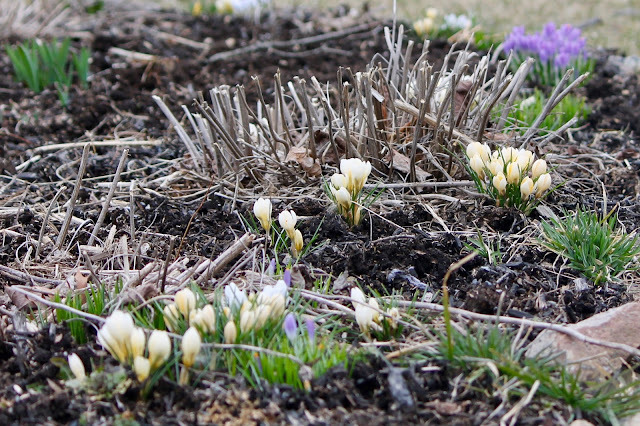 How was your March garden this year? I am greatly enjoying this meme, Sarah. And it motivates me to get our there and take photographs even on cold days. It gives a more comprehensive recording of what is going on in my garden. 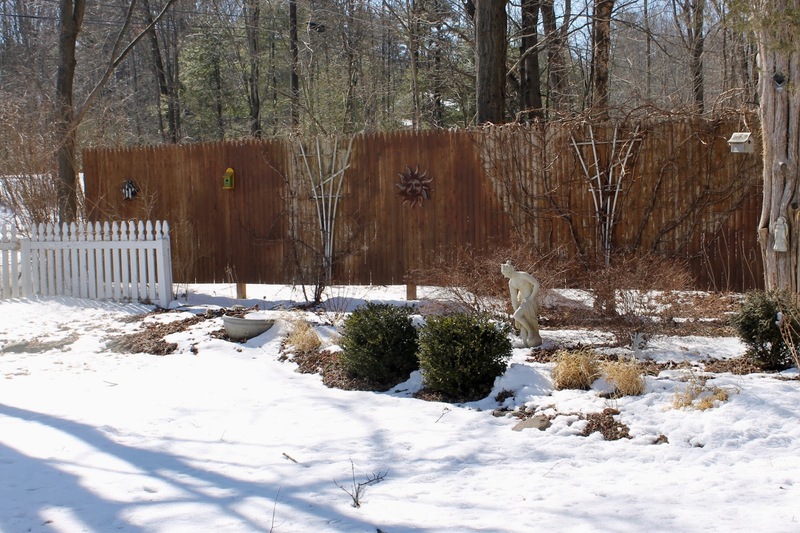 Our March gardens look very much alike, except we didn’t see any snow on the ground. This year March came in, and went out, like a lion. Same here. Hope its not a portend of a bad-weather summer. 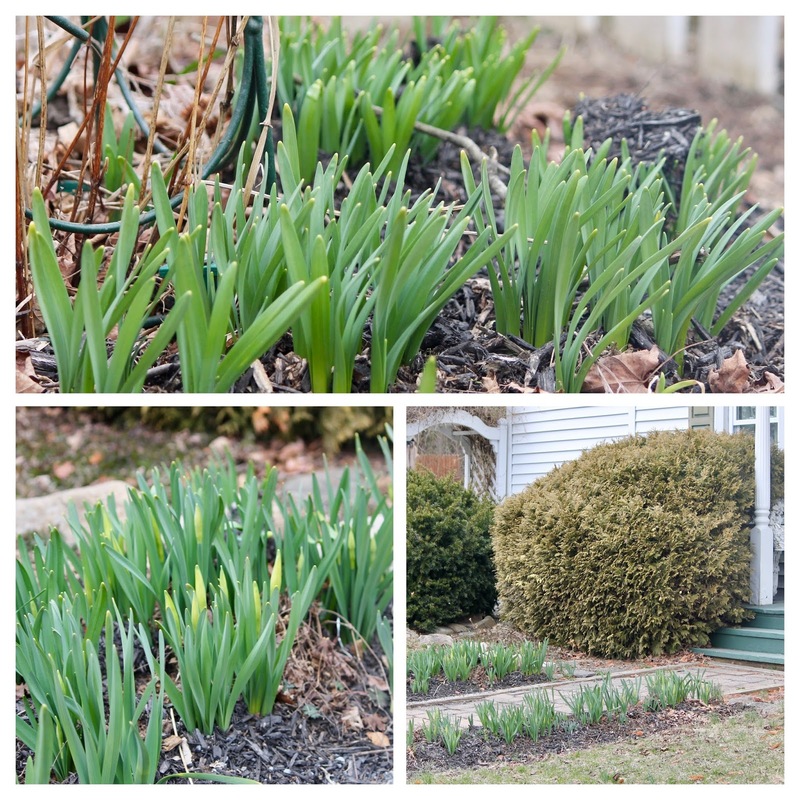 It looks like spring is finally peeking over the windowsill in your garden. That's a lovely little new horse that you have. I'm sure he will add much to your menagerie. I am sorry though to hear of your fish. Herons are always a concern and it is important for the fish to have a place to hide. As the temperature rises and more fish come out of hiding, we see that the heron took very few. Such a relief. The grandchildren gave each one a name, so we hated to lose them. 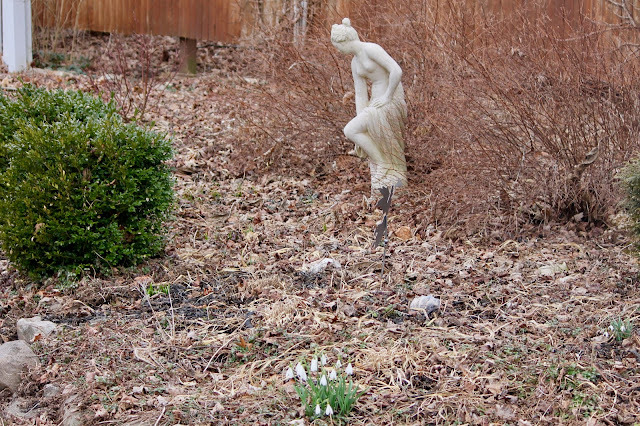 Your garden is looking very spring-like and I love the crocuses, snowdrops and the beautiful Eastern Bluebird. 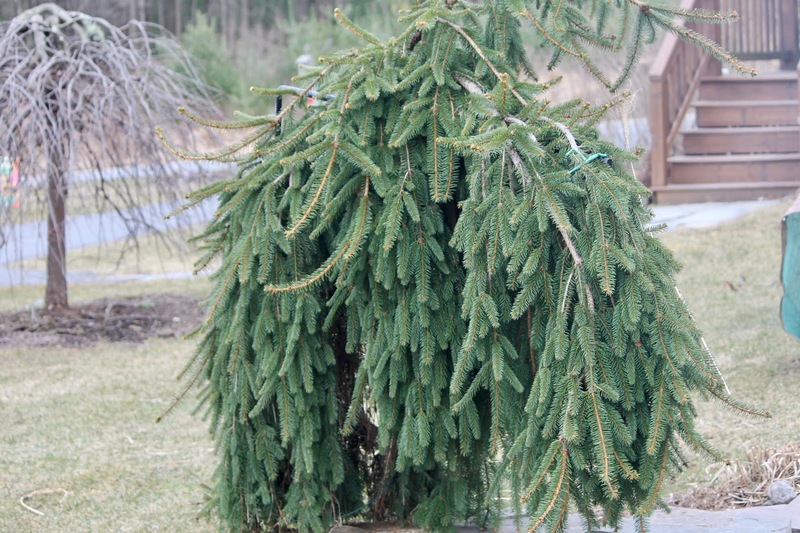 Your Weeping Norway Spruce is looking very full and healthy. 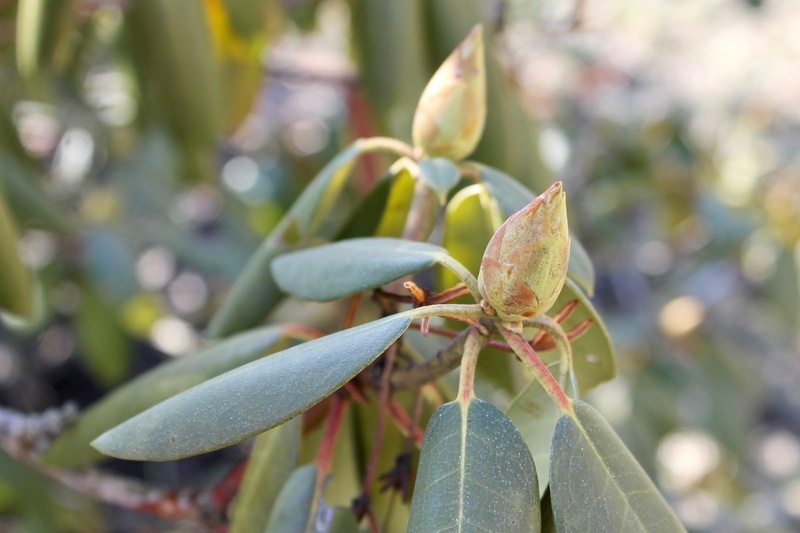 It's one of my favorite plants...as you probably already know! Happy Spring! 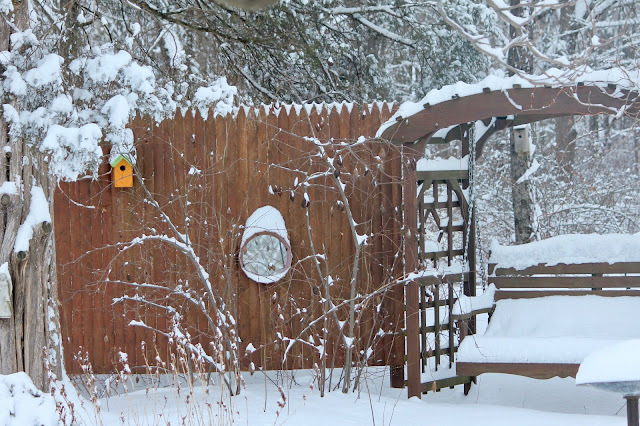 Ooh did your cold frame survive that pile of snow?! Yes, Diana, it did. Just a little damage on one corner of a lid. So many wonderful signs of spring! The snow is now melting around here, so I'm hoping to see some green poking out soon - can't wait. And congratulations on the new member of your family! Thank you, Margaret. We are enjoying Charm very much. Our March sounds similar to yours, with snow at the beginning, but a mix of cold and warmer rain towards the end. I love bluebirds! It's so nice to see the early blooms starting. 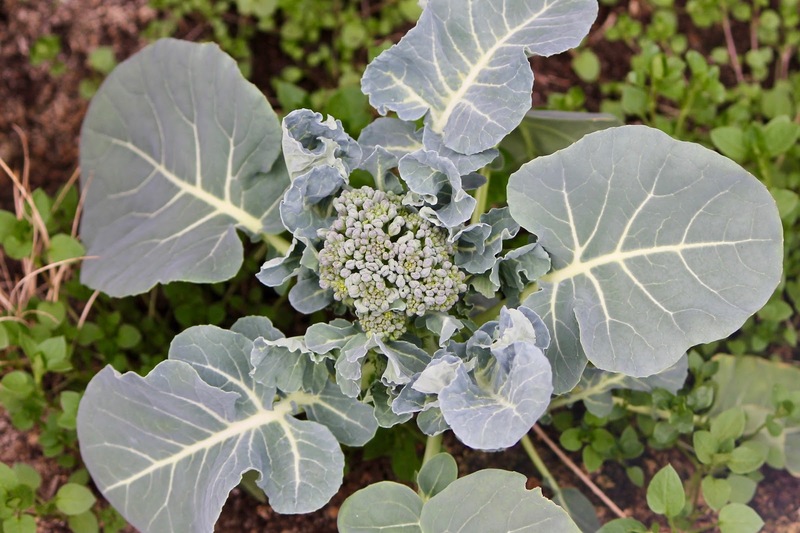 I'm so impressed that your broccoli made it through the winter! A cold frame is an amazing invention! 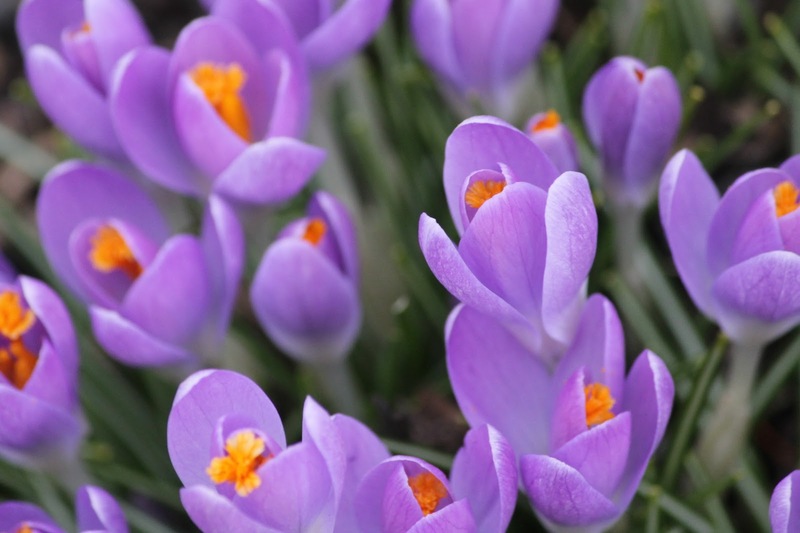 Good to see the signs of Spring in your garden Pam. What about those Bluebirds, just fantastic, she looks a bit like the British Robin.I was never a fan of the collage in the past, but when I see how you use it I am having second thoughts, 3 pics in this manner is perfect. Bluebirds are much bigger than British robins, Alistair, but they remind me of them too. I use collages because if I show each photograph separately it makes for a very long blog posting. I aim for 12 to 15 total pictures including collages.